Thanks for the layout, could you summarise the changes you made to convert it to 13700 from 3080? Also, the first layout has the 10M-to-ground bias resistor connected to pin 4 rather than +ve input pin 3. Well spotted! It has been corrected. I didn't use Diode Bias, Buffer In and Buffer Out. 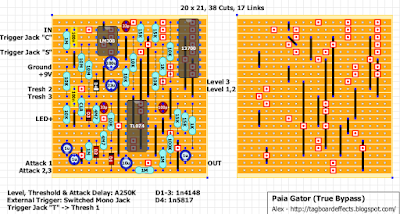 I think with TL061 you need to remove the 33p cap between pins 1 & 8. Yeah, I forgot to say I already omitted the 33p. What I also did was wrongly place the 100n cap coming from the threshold pot, ahem. Once I fixed that there were swells abound :). I would consider this verified. I have to order some A250k pots though, the interaction between knobs is very weird now. It also seems the volume pot would work better with a linear sweep. Well done Paul! Schematic didn't mention Log or Linear. 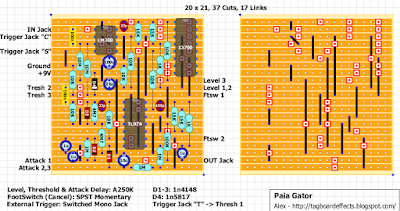 Did you add 9V to pin 9? How does the pedal sound? Like commented below I also left out the 9V to pin 9, it bypasses the effect. The effect sounds good, you have to adjust your playing to it a bit but there's a good range on the attack delay. The only thing I changed was the threshold pot, I ended up using a 50k. I think they used a large value to handle external signals but for my G&L tele with single coils it was only usable fully CCW. Hi Paul, can you please explain what the external trigger is for and how you built it without the trigger jack?! I assume you just omitted the wires `Trigger Jack "C" and "S", but what about the wire that goes from `Trigger Jack "T" to Tresh 1? Thanks for that. It's another input to the effect to control the gating. The way to remove it is already explained in the introduction: don't connect the Trigger Jack and just connect Thresh 1 to where it says Trigger Jack "C" on the board. Built the True Bypass Version, the second 1µF in the series pair to make 500nF in the bottom left is the wrong way round, flip it round and it's verified. I tried a 470nF and I can't say I noticed any difference, so I'd say that's an option too. Cool. I'll change that. Did you connect TL074 pin 9 to +9V? How does it sound? Haven't tried that yet, as far as I can see on the schem isn't that effectively just a bypass for the swells? It's pretty good, there's a bit of a noise floor when the gate is closed, but the LM308N I ordered in looks like a counterfeit, so it could be that, I'll get the LM308 out of my Rat tonight and give it another go. On longer swell times there can be some artefacts/distortion as it slowly crosses the threshold, but that's to be expected. 250KA for the volume doesn't seem like a great choice either, I'll try some others out tonight and report back. 100kB makes a better choice for level I think, and the noise floor was down down to the dodgy LM308, with the good one from my Rat it's quiet as a mouse. If you want longer fade in times, just up the value of the attack pot, 1M gives you a good 5 or 6 seconds before the fade in even starts. 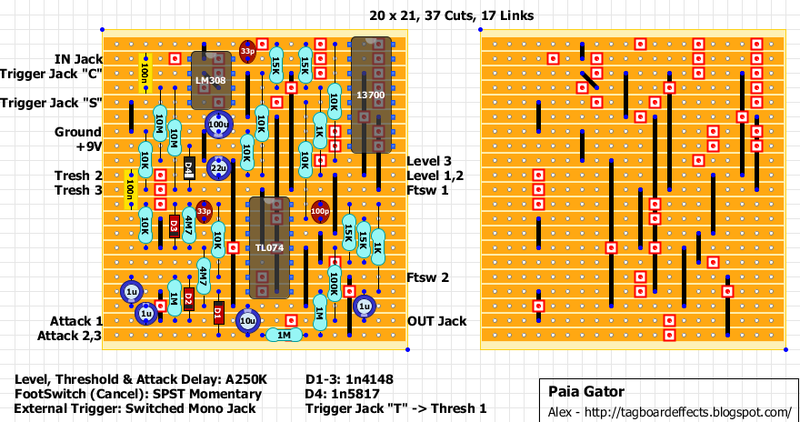 Just FYI, the 1µF caps in the bottom left of the layout still aren't in series, the bottom one of the pair needs flipping around to make it verified. The way they are they should give a 500nF NP capacitor. Hi, just built the true bypass version. As mentioned above, the lower 1uF cap of the left-bottom pair is flipped (wrong polarity). I used TL061 with omited 33p cap instead of TL308 and 100kB pot for level and it works like a charm. It's very unusual effect. With longer attack and with long-feedback delay after, it works incredibly for "Frippertronics" sounds. With shorter attack, it gives bowed "cello" sounds. OK, thank you for explanation! Hi. I only have a stereo switched jack and was wondering if the trigger jack "C" goes with the tip or the sleeve? I assume the tip but want to be sure. 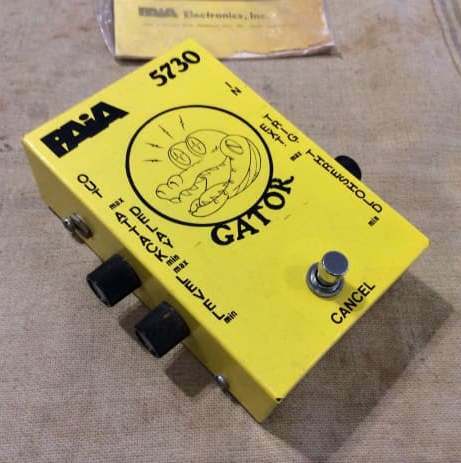 Also has anyone used an NE5534 in place of the lm308? Is there anything I need to know if I use the NE5534? Hi to everyone. I built this today and its very cool. But with my low output Pickups on my main guitar the threshold is too high, it cuts off way too quick after the gate opens (During the decay of the note). 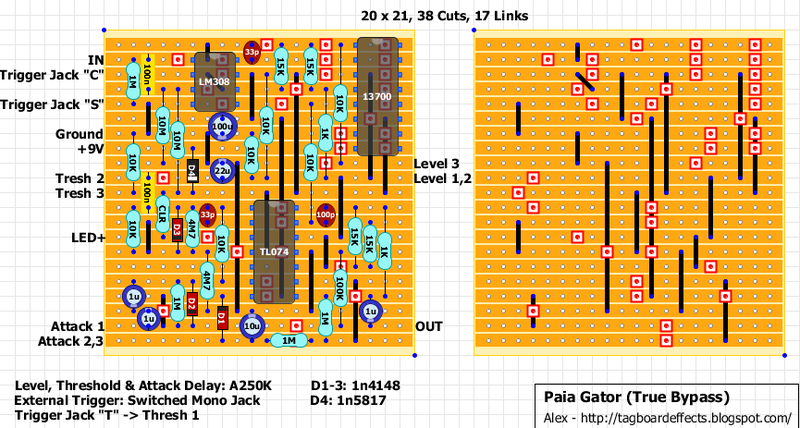 I'm thinking of putting a boost in front of it (better even a compressor, but thats tough in one enclosure). Do you know of any mods that would change the threshold? Thanks everyone, and thanks for the awesome layout!! !